One of the best termite companies in New Jersey! If Customer Satisfaction and Experience are important to you, take a look at North Jersey Termite. We’re # 1 in Customer Satisfaction for termite companies on Superpages.com. Want to read Independent reviews? 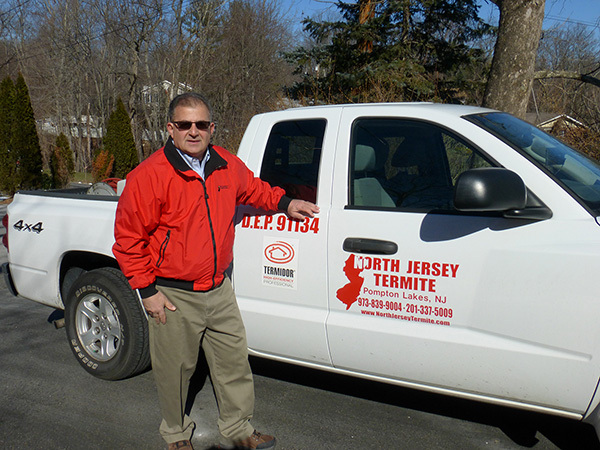 North Jersey Termite has the highest independent customer satisfaction ratings in Northern New Jersey. It isn’t a coincidence that North Jersey Termite has more 5-Star Independent ratings versus competing termite companies. It is simply because that we are very good at what we do best. Specifically, Termite and Ant control treatments. Since 1969, Owner “Ed Assidio” has inspected and treated well over 16,000 homes and businesses in his career. Given the owners four plus decades of dedicated service and experience, (ask yourself) would you really want another Pest Control Professional to manage your termite or carpenter ant needs? Thousands of our customers have entrusted us to protect their homes against termites and carpenter ants. Shouldn’t you be one? 40+ Year Professional Ed Assidio began his career as a service technician with Aamco Exterminators, formerly of Bloomingdale, New Jersey. From 1975 through 1980 he took over as manager then regional manager of Aamco Exterminators. In 1980, Mr. Assidio left Aamco to form North Jersey Termite & Pest Control, Inc. From 1980 to present, he has successfully treated many thousands of homes and businesses in the North Jersey area. State Licensed, Ed Assidio brings a great deal of knowledge and expertise in the control of Wood Destroying insects. Some of his specialties include Termidor Liquid and Foam treatments, the Revolutionary Advance Termite Bait System and Bora-Care Wood Treatment applications. Owner Ed Assidio is also a Termidor Certified Professional. A Termidor Certified Professional is a licensed pest control operator who has completed the official Termidor training program, passed a Termidor certification exam, and been officially certified by BASF to use and apply Termidor. Only a Termidor Certified Professional can treat your home with Termidor. Termidor is registered with the Environmental Protection Agency and can only be applied by a pest control professional who has been trained in correct application methods. “Termidor” is a revolutionary insecticide! With just a single application of Termidor, North Jersey Termite has achieved a remarkable 100% Colony Elimination track record in each and every home and business that we have treated for termites. Termidor is applied at very low rates. Typically, the active ingredient (fipronil) is just 0.06% of the solution, a concentration much lower than that of older liquids and less than most insecticides. For an average home treatment, only about 8 ounces of the active ingredient is actually used. Keep in mind, too, that since 1995, fipronil has been used around the world for flea and tick control on household pets and on agricultural crops to protect food supplies. And Termidor has virtually no odor, which means you and your family won’t notice a thing. No better choice for termite defense. America’s #1 termite defense with over 3 million homes treated since 2000. Kills by ingestion, contact, and the “Transfer Effect,” meaning affected insects help spread Termidor throughout the colony before dying themselves.